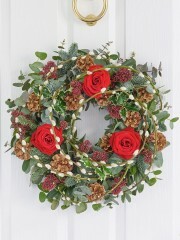 The Festive season is never far away and the best way to say ‘Merry Christmas’ is through Flowers Stonehaven Christmas Bouquet Delivery service. 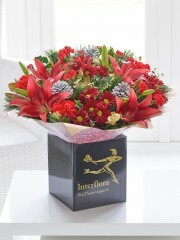 Florists Stonehaven deliver winter flowers across the North East Scotland and with 40 years’ experience you can be sure that your loved one will be more than delighted to receive their fabulous bouquet. With a number of expert Stonehaven florists they know exactly how to please, carefully picking the finest quality flowers and carefully arranging them with the utmost skill. You can be sure you are getting value for money when purchasing from Stonehaven Flowers, all flowers selected by our expert florists are guaranteed to have an impressive life time. 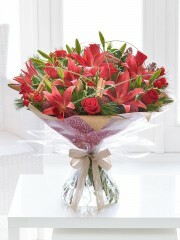 Stonehaven florist Christmas collection is the perfect way to show someone how much you care. Sending warmth wishes of the festive season with a bouquet or basket of the finest winter flowers is the ultimate way to brighten up someone’s day. 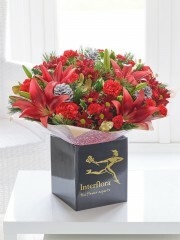 Several different flowers are available to order including red Asiatic lilies, classic large-headed red roses and delicate red carnations, all hand tied together and accompanied with diverse foliation. 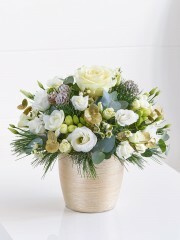 Spruce, holly and eucalyptus leaves really held each Stonehaven florist flower bouquet to flourish. 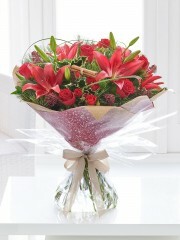 Just as you believe your chosen special somebody deserves love and care, we place the same amount into each and every individual Christmas bouquet arranged by Flowers Aberdeen. 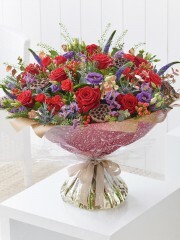 We will be sure you are delighted with our extensive range available online however if you opt to choose a bouquet based on your own or your loved ones preferences, the expert Stonehaven florists are pleased to help. 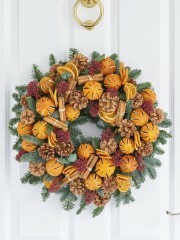 They can offer you guidance on which flowers to include, to create the most eye-catching gift for someone’s holiday season. 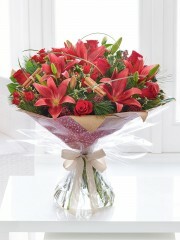 Flower Delivery Stonehaven want to provide their customers with a flower delivery service of pure professionalism. Our unique network of delivery drivers enables us to offer our services across the North East. 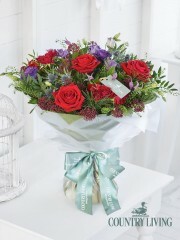 Stonehaven flowers offers a fabulous Same Day Delivery offer 6 Days a week. 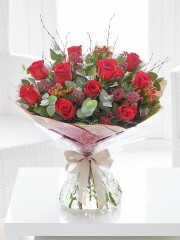 This option means that you are never too late to send your cherished one a stunning bouquet of flowers, provided your order is taken before 3pm. 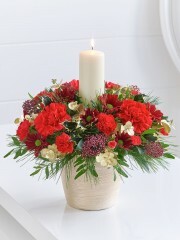 The other options Stonehaven Flower Delivery have available is their standard next day delivery which runs from Monday to Saturday throughout the year. 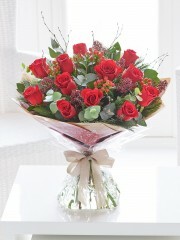 You will never be disappointed in the way Stonehaven Flower delivery do their job, always with your convenience in mind. 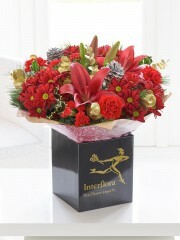 You can choose when you wish for your order to be delivered, whether that be before 1pm or in the afternoon at 1pm. 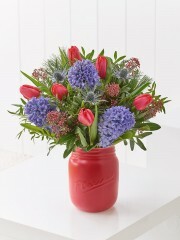 This way we can ensure that your recipient will get the full enjoyment and impact of the surprise of having their flowers delivered to them. 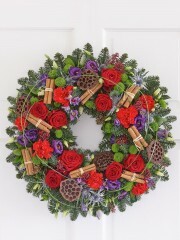 It is always Stonehaven flowers’ aim to please and if you want a high quality Christmas bouquet we are the best place to come. 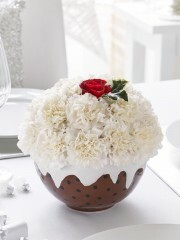 Once placing your order you can sit comfortable knowing that your bouquet is being carefully handled from the moment the expert Stonehaven florists begin the arrangement until the point Stonehaven Flower Delivery bring your flowers to its destination. 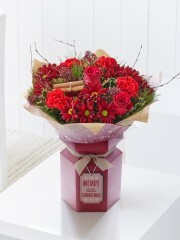 There is no better way to spread the joys of Christmas than to send a beautifully presented flower bunch, organised by florists with years of experience, directly to your loved ones door. 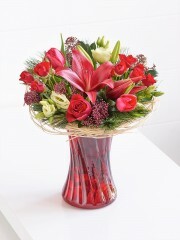 You may also decide you wish to make your order that little extra special. There are a range of present you can ask Stonehaven Flowers to deliver with your flowers including delicious chocolates, fine wines, or all together in a delightful gift basket. Whatever you decide, we can assure you everyone will be happy.